Shark Tank's 100th Episode airs 5 years and 5 days after the show premiered on August 9, 2009. The format was a hit in Japan, the UK and Canada for years, but this was the first US incarnation. The producers actually advertised on Craigslist to recruit would-be contestants that first year. The first two seasons only had 23 shows combined. It was season three when the Shark Tank took off. Mark Cuban, a highly recognizable and outspoken billionaire, joined the cast of Sharks full-time in season three, which helped propel ratings into the stratosphere. That's when I came “on the scene.” I wrote a guest post on February 11, 2012, the morning after the now famous episode 304 featuring Show No Towels, The Swilt, Puppy Cakes, and The Wine Balloon. I was familiar with the show, but I'd never really critiqued a TV show before. I kind of ripped Eric Corti for the deal he made (which never went through). A week later, I joined Shark Tank Blog as the full-time writer in residence. I was doing it as a part-time thing to pass the time while disabled due to abdominal surgery. Little did I know then that nearly 3 years later Shark Tank would be celebrating their 100th episode and Shark Tank Blog would become my full-time business! At first, I was working with a business partner. I ended up reaching an agreement to buy the blog and make it my own about a year later. I enjoyed working with a partner because I wasn't responsible for EVERYTHING, I just needed to write. Owning the site myself is more work, but the rewards are greater. After that first post, I took a step back and decided criticizing the show was the wrong angle to take. I made a conscious decision to support the entrepreneurs who appear on the show. After all, I was kind of in the same boat as them – I had a business that is a blog about businesses that appear on a business themed reality TV show. I thought, if I supported the entrepreneurs, they'd support me back and we'd all do well. I thought interviewing people who appeared on the show would be a good angle. Some media were doing it then, but not many, so it was a unique angle. Now that the Shark Tank is airing its 100th episode, there are now DOZENS of blogs about Shark Tank (there was only one other when we first started) and you can't go a day without some major media site posting a “8 Things Business Owners can Learn from Shark Tank” type of article. Thankfully, when we started out, we were well ahead of the curve. As I set out to do interviews, some people were skeptical. I had to beg and plead and follow-up several times with some entrepreneurs. After a few weeks, I got the hang of it and word got out that this Shark Tank Blog guy was OK and he'd give you a fair shake. Since then, I have spoken to over 80 people who've appeared on the show, interviewed Barbara, Lori, and Daymond; met Daymond twice (once at a cool NY City Party) and met Barbara once. What a wild ride it has been! Both Shelly and Scott appeared in season three. Shelly was the adorable, likable, All-American Girl that everyone rooted for. Scott was the bombastic, controversial villain everyone rooted against. Both are very nice people and both of them were very kind to speak to me early on in the life of the Shark Tank Blog. Their interviews gave the site credibility. Shelly even managed to get me on the phone with Lori Grenier! When other entrepreneurs saw these two Shark Tank “stars” were OK talking to me, the rest quickly followed. I've been an entrepreneur myself since I was 10, but I don't claim to be a business expert, though writing this blog has taught me a lot. What I set out to do was create a resource about The Shark Tank that didn't have all the media bias of the ABC Official site. I also wanted to tell the stories of the entrepreneurs – the stuff that didn't make it to air. I've probably spoken to more people associated with the show than any other blogger out there, (though TJ Hale is getting close) and I have forged some good friendships and business relationships with some of the Shark Tank entrepreneurs. The show has truly blessed me. In season four, ABC bought 26 episodes, so the work load ramped up significantly. It seemed if I wasn't writing about Shark Tank, I was talking to people about Shark Tank. There was a point where I got a bit cynical about the show and contemplated quitting the blog, but I pushed through it. I also bought the site outright in season 4. A funny thing happened in season four. PR firms began contacting me asking if I'd interview their client who was going to appear on Shark Tank. I didn't have to chase people anymore and that was a big relief and time-saver. The site began to take on a life of its own. I got calls from the NY Times, Wall Street Journal, and other media asking for commentary. I had, apparently, become an expert on Shark Tank! While running the site may look glamorous and fun from the outside, it's hard work. I write about 2000 words a day and I have to do a fair amount of research. Couple that with monetizing the site, doing interviews, tweaking the back-end, and the dozens of other tasks involved with running a website, and I often work from 8:30 AM to 10 PM – sometimes even later. I, like the people who appear on Shark Tank, am dedicated to my business and I want it to be the best I can make it. Some days it's easier than others, some days the writing is better than others, but I get at it every day with all the energy I can muster. That's what made it successful and propelled it to the 100th episode. Sure, the Sharks are entertaining and the businesses showcased each week are interesting, but the over-riding, compelling reason the show is a hit is it inspires people. It's inspired me, it's inspired many of the entrepreneurs who appear and it inspires the millions of viewers who watch every week. 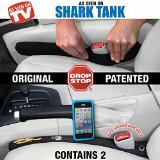 The show has spawned its own sub-culture, which I am part of, and created an entire new industry: Shark Tank products. When I sat down to write this post, I didn't know it would be as cathartic as it was. I guess now that Shark Tank is at the 100th episode milestone, it means it will live on in syndication for years and will likely continue to be a network phenomena for many years. What that means for me is I will have a business for years to come, too. Shark Tank has been good to me, and I'd like to thank everyone who has helped make Shark Tank Blog a success: the Sharks, the entrepreneurs, and most importantly, the readers. I hope I can write a 200th episode reflection. If I do, I'll try to make it shorter! Seriously, a kind hearted blogger like you is the best part of Shark Tank.